It can be tricky when you are on a special diet, like gluten-free or are simply trying to eat healthier. Seems like the most nutritious foods aren’t very appealing, and the most yummy goodies are nothing more than empty calories that derail you from your goals. And what about convenience? You want something you can tuck into a purse or briefcase or grab at home when you are too ill to cook. There is something that meets all the above criteria: KIND bars. Their motto is: “Wholesome natural ingredients you can see and pronounce”. Every single one of their products is certified kosher and certified gluten free. They are also free of sulphur dioxide, GMOs and trans fats. Several of them are low on the glycemic index, good news for diabetics. But the best part is that they are really delicious! KIND bars are nut-based and about the size of a small candy bar. Some contain dried fruit, some have dark chocolate, and some contain crispy puffed rice sweetened with honey. You can also choose which nutritional feature you want to emphasize in their Plus bars (which have plus signs on the package): anti-oxidants, protein, calcium, fiber or omega 3. The nut varieties include almonds, macadamia, cashews, pecans, walnuts, peanuts, and brazil nuts. All contain at least some fiber and protein; actual amounts vary depending on ingredients. The toughest part is deciding which one is best! There are about 20 varieties of KIND bars. My personal favorites are: Almond & Coconut, Cranberry Almond + Antioxidants, Peanut Butter Dark Chocolate +Protein, Dark Chocolate Cherry Cashew + Antioxidants, Almond Walnut Macadamia + Protein, Nut Delight, Almond Cashew with Flax + Omega 3, Peanut Butter & Strawberry, Apple Cinnamon & Pecan, and Mango Macadamia + Calcium. I have not yet had the opportunity to try are their Healthy Grains Clusters. These come in pouches and contain multiple servings. These are also all gluten free, instead boasting ingredients like quinoa, amaranth, buckwheat, chia and millet. I first discovered KIND bars at my local health food store. They can also be purchased online. 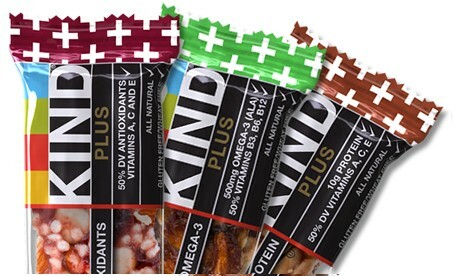 KIND’s website has lots of product and company information: http://www.kindsnacks.com For a healthy snack that you might actually crave, join the KIND movement. Funny you would even eat one knowing you have a nut allergy as I have yet to come across one that does not contain nuts. Maybe you should read the ingredients before consuming; that is if you can read. Should that truly be the case and a medical Doctor and expert witness could prove this you might have a case depending on the State you live in. However, I would find this claim very hard to believe and suggest that the makers of KIND bars sue you for slander. I was two months pregnant and kind snack bars terminated my pregnancy ! Not-so-kind bars is what they should be called. .
One of my fave g-free bars. These bars taste great but aren’t a huge full meal as so many g-free bars are. They have lots of fruit and nut chunks and recognizable food bits, and aren’t hard like a crunchy granola bar, but are slightly bendable like a bar held together partly by honey. A little sticky. Found them at Target, of all places, where, alas, they’re sold individually. Also sold at our local independent health-food stores. These bars are amazing! The first time I had them was at Christine’s un-bday party. Dark chocolate cinnamon pecan was my favorite. I haven’t seen them in the stores yet. If anyone has seen them on Long Island let me know! Cherry Cashew + Antioxidants and it was awesome now i always have 2-3 of this bars in my office drawer.As it is non-gluten product so i am sure , my elder brother will also like it. For diabetes, I found and use Builder Bars. They have 20 proteins and are so much better than candy or granola bars. I love the cranberry almond. I buy them by the box in our local grocery store which has a health food section. I always have a couple in my purse. Interesting article. Never heard of these before. It seems hard to find a healthy snack bar. Anybody know if these are related to Cliff Bars? sawdust. How is it taste wise? They are all so good, but just like all non-gluten products, they are pricey. I think our grocery bill doubled when we went totally non-gluten. You can buys them at REI, Whole Foods and health food type stores. I like the one with cranberries. Larabars have only 2, 3 or 4 ingredients per bar, so for people with multiple allergies/intolerances, they are a must. There is many a time that I have been promised a “something” free meal only to find that it wasn’t, so I always have one or two emergency Larabars with me. I have not been able to find them in grocery store, convenence store or pharmacy. Any ideas about where to find them? Great to know since I recently found out I am allergic to dairy and gluten intolerant. These bars are the best, I like the almond & coconut. I have tried most of them already, but I did not know about clusters. I will be looking for them in my local health food store. I wish I could like these, but the second time I ate one, it triggered my nut allergy. Sorry to say, I won’t be trying one again, even though it might only be one flavor, or one batch that caused me problems.